I think we’ve gotten past the point of explaining what monthly favorites are so without further ado, here they are! LL.Bean Shirt – My mom actually gave me this shirt and the same one with navy stripes and they are so classic! I can’t help but feel slightly sailorish when I wear this and I love it (I later found out that the shirt literally has “sailor” in the title..). I pretty much lived in this shirt for three days straight after my wisdom teeth removal because I wasn’t thinking straight enough to change my outfit. Whoops! 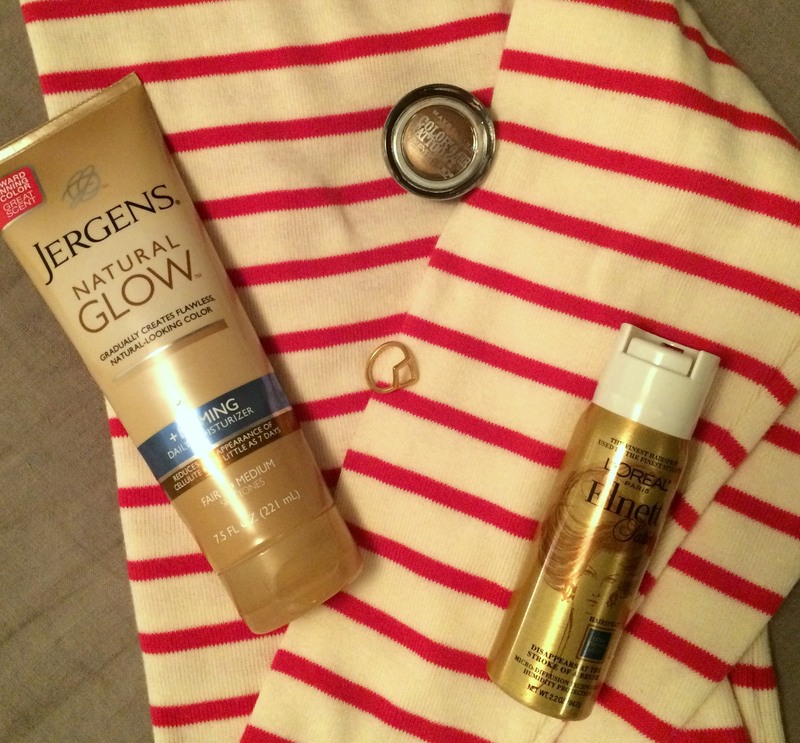 Jergens Natural Glow (Firming) in Fair to Medium – Not gonna lie, I just realized I purchased the firming formula of this stuff. But either way I think it works really well! I’ve been trying to keep my tan in tact since getting back from Antigua and it seems to be doing the trick! I’m still getting people coming up to me and saying I look tan 🙂 My only qualms are that the scent is a tad too sweet for me as I tend to go for lighter ones. But given the results, I can deal with it. Maybelline Color Tattoo Eye Shadow in Bad to the Bronze – I talked about this product briefly in my mini haul but I haven’t been able to put it down. I’m going to Maine for the 4th and this product with a little gold shimmer on top is probably all I’m going to wear for eye shadow. I’d highly recommend this product for people on the run who don’t have time to put together a full on eye look cause this stuff does it all. No brush required. 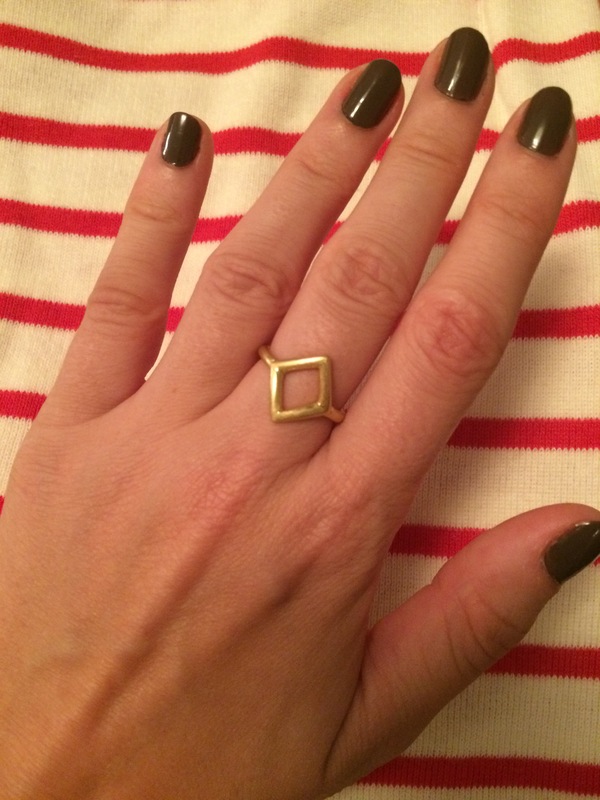 Madewell Ring – I’ll say it before and I’ll say it again: I love symmetrical jewelry. So when I saw this symmetrical little trinket and realized that I didn’t actually own any gold rings it made decision to buy it very easy. I haven’t taken it off since. L’Oreal Elnett Satin Extra Hold Hair Spray – I sprayed this stuff through my freshly curled hair on Saturday night and I still had waves on Monday. I can’t for sure say if my curling wand or the hair spray was more responsible for this but the fact that this hairspray still allows me to run my fingers through my hair and brush through it makes it a winner for me. Not to mention the scent is not overly “I USED HAIRSPRAY,” which is always nice. I already have a backup of this one in my bureau. Due to the 4th of July holiday here in the US I won’t be posting tomorrow so have a great weekend! Will do! Thanks for stopping by!